62 MMS December 2017 mmsonline.com CNC TECH TALK Columnist We traditionally think of the display screen pages provided by CNC manufacturers as fixed and unchangeable. We work within the confines of what is provided and do what is needed to get our tasks done. Need to see the distance-to-go value? Call up the program check display screen page. Need to enter a tool offset? 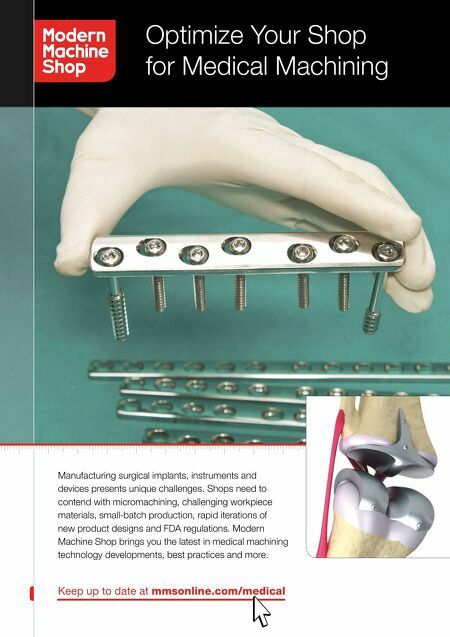 Select the offset display screen page. Want to modify a program? That's done on the program display screen page. But have you ever found yourself questioning the way display screens are arranged or wanted to modify the way they work? Until recently, you were out of luck in this regard. Now, however, some CNC manufacturers have begun to provide a way to modify this human-machine interface (HMI), allowing you to create custom display screen pages that are more in line with your company's specific needs. The program used to create custom display screens for FANUC CNCs is called FANUC Picture, and I will use it here as a reference to describe some of what is possible. Other CNC manufacturers likely have similar programs. The original intent of the CNC manufacturers was to give machine tool builders and integrators t h e a b i l i t y to c u s to m i ze t h e m a c h i n e s t h e y sell—not to help end users. This is similar to the thinking behind FANUC's Custom Macro para- metric programming language. Custom Macro originally was created to allow machine tool builde rs to inte r face with ce r tain acce s sor y devices, like probing and post-process gaging systems. FANUC never dreamed this ability would be so important to end users. As we now know, Custom Macro has provided countless benefits to end users who have mastered its capabilities. The potential benef its of creating custom display screens are even more formidable. FANUC Picture provides full access to CNC functions (offsets, parameters and so on) and programable machine controller (PMC) functions. Scripts can be written to instruct the CNC and PMC, making them per form just about any imaginable task, from turning on a light to changing a tool offset As an example, consider the sizing adjustment application discussed in a CNC Tech Talk column earlier this year (visit shor t.mmsonline.com / cncsizing ). I suggested using a spreadsheet running on a mobile device to specify measured dimensions. The spreadsheet responds with the offsets to be changed along with the deviation amounts. While this simplifies the process of making sizing adjustments, it still requires the operator to make the related offset entries. With FANUC Picture, a custom display screen can be created to close the loop, performing the tasks of the spreadsheet and modifying the appropri- ate offsets. This application barely scratches the surface of what is possible. As with Custom Macro, you really need to start wrestling with FANUC Picture before its implications and potential applications become more obvious. 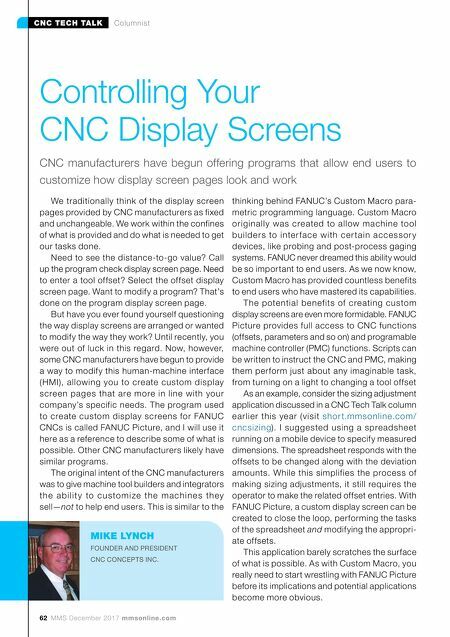 Controlling Your CNC Display Screens CNC manufacturers have begun offering programs that allow end users to customize how display screen pages look and work MIKE LYNCH FOUNDER AND PRESIDENT CNC CONCEPTS INC.